In June 2014, the Great Homeschool Convention is coming to Ontario, California. I am delighted that one of the keynote speakers is Michael Medved, popular radio show host and author of Saving Childhood: Protecting our Children from the National Assault on Innocence. Michael and his psychologist wife Diane, have written an important work about how our culture seems intent through the forces of media, schools, peers, and even other parents, to rob our children of the beauty, innocence and wonder of childhood. Strikingly, Saving Childhood was first published in 1998, and we all know that the media climate has changed dramatically in just a decade and a half. Medved wrote before the smartphone had taken over the lives of so many young people, thus compounding dramatically the potential negative effects of media saturation, not to mention the inherent dangers of exposure to a myriad of digital dangers. 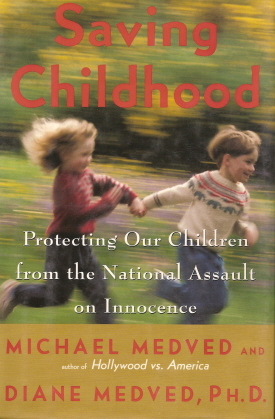 Reading Saving Childhood isn’t always a pleasant read, the statistics and stories about children involved in crime and sordid behavior makes one’s heart break for the very loss of innocence the Medved’s lament. But the book is also one of hope and especially direction in regaining our passion and purpose for parenting. The stories of real children whose lives have been irreversibly damaged because of a lack of parenting provide ample incentive for really taking this job of protecting our children seriously. While many of the dangers of growing up in 21st century America remain the same as those we confronted as children ourselves, the digital age has presented an entirely new level and immediacy to potentially harmful experiences. Since the Medved’s book was published prior to the age of the smartphone, as parents we need to educate ourselves on the dangers unique to this brave new world. 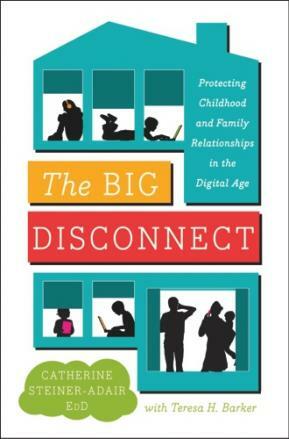 In The Big Disconnect: Protecting Childhood and Family Relationships in the Digital Age by Catherine Steiner-Adair, parents can explore the kinds of incidents that are happening to children all over the country, hopefully before they happen to more innocent children. You can read an insightful (and perhaps convicting) review of The Big Disconnect from the NYTimes here. These books would both make great Christmas vacation reading, so consider getting them for yourself or someone you love! I’m doing so myself! Also, don’t forget to sign up for the Great Homeschool Convention coming to a city near you! I will be speaking at the Ontario, California convention too! Any GHC tickets purchased through our Beautiful Feet Books link will automatically generate a $5 donation to the Brent Blickenstaff fund, which you can read about here. And for one more day–up until midnight November 30–you can get a discount rate on your ticket purchases. Hope to see you there! Ooo I’ll certainly put this on the christmas list for my wife, looks so up her street! Cool, I actually have the book by Michael Medved. He signed it for me. But I guess I should probably read it now that it has been recommended. That’s fun that you have an autographed copy! I think Medved is a good social commentator and has his finger on the pulse pretty well. The only drawback of the book now, is that it needs to be revised based on the sea change in social media. The other book I reviewed in the blog makes a perfect balance. Thanks for visiting! Cheers.